Pretty much every morning, the same routine goes down at my house. I open my eyes. My dog, Pigeon, jumps off the bed and sits. I ask her if she wants to go outside. If she does, she thumps her tail on the floor and springs up. At the top of the stairs, she pauses; I say "downstairs" and gesture for her to go ahead of me. 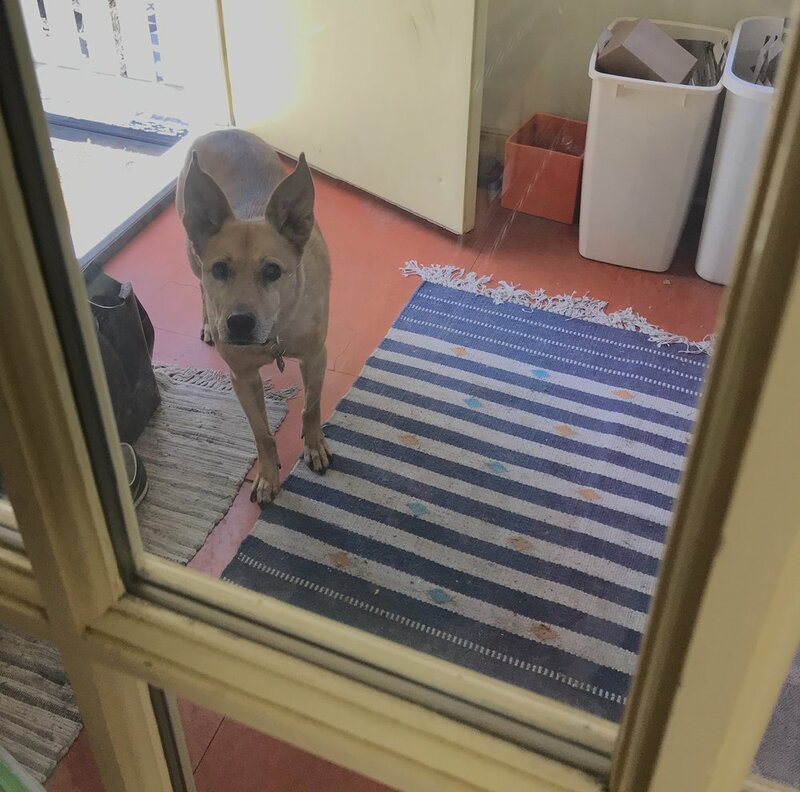 In the kitchen, I open the back door and let her into our fenced yard, leaving the exterior door open but closing the interior glass one to keep out the bugs or the chill. While she’s doing her business, I grind coffee, scoop grounds into a filter, dump water in the reservoir, and push the start button. When Pigeon’s ready to come inside, she sprints up the back stairs and stands at the glass door. When I see her, I open the door and let her in. Or rather, I usually do. Before I could start my coffee the other day, I had to empty some old grounds and rinse the filter. In the process, I got cold, wet coffee grounds all over my fingers. When Pigeon showed up at the door, I was still rinsing my hands at the sink. I saw her standing there—but instead of going to the door, I finished rinsing, and then turned off the faucet. Then I debated whether to try operating the doorknob with with wet hands, and decided instead to dry them off with a towel. Then—finally!—I let her in. In other words, I blew off Pigeon's cue for me to come to the door and open it. If I were the dog in this scenario, how might you describe me? Was I being disobedient? Stubborn? Willful? Vengeful? Dominant? Or was I just distracted by something that felt slightly more pressing to me than opening the door at that moment? Did getting the grounds off my hands under those circumstances simply promise a more valued outcome than opening the door? When your dog responds to a cue, he does so because past experience has taught him what behavior is likely to be reinforced when that cue is present. And this isn’t only true with positive reinforcement (following behaviors you want to increase with consequences the dog wants). Relief from an aversive, such as a release of pressure on a choke chain when a dog sits, is still reinforcement. Specifically, it’s negative reinforcement (following a behavior you want to increase with the removal of something the dog wanted to escape or avoid). And as people whose dogs have run through an electronic fence to attack another dog or catch a rabbit can tell you, the value of this type of reinforcement is also relative. As we move through life, there are almost always multiple reinforcers available at any time. Have you ever been called to dinner and replied, “Hang on, there's just two minutes left in this show?” Disobedience—a term I pulled out of the mothballs of my mind for this article—is the the dog telling you (a) he’s confused about what you want or (b) something else is just more important right now. Sometimes it’s getting something he wants; sometimes it’s escaping something he doesn’t. My behavior of opening the door when Pigeon appears has become pretty reliable. It’s been reinforced many, many times by my dog's cute little wiggly greeting. But on that particular day, removing those wet grounds from my hands was more important. I also almost always step on the brake when I see a stop sign, to the point where it seems automatic. But if there are no other cars visible, or if I'm running late for an appointment—if the usual reinforcer of avoidance isn't as valuable, and/or getting on with my trip quickly is more valuable—I might not perform this behavior as reliably. Our dogs’ lives, like our own, are a constant stream of competing reinforcers—and on top of that, the things they’re most interested in are often telegraphed to them by smells we can’t smell and sounds we can’t hear. So how do we ensure 100 percent reliable responses to our cues? FIRST: Make sure you are not the thing your dog is trying to avoid by doing whatever else he’s doing. Punishment is often associated with the punisher—and we are sometimes punishing our dogs even when we don’t think we are. Does your dog’s recall cue usually mean the end of fun in the yard or park? Does your dog’s name mean it’s time for nail trims? Does your dog actually duck or back away when you pet him to "reward" good behavior? THEN: Make the odds work in your favor by understanding and applying a behavioral principle called the Matching Law. The Matching Law says, in a nutshell, that animals exhibit behaviors in proportion to how much reinforcement has been available for those behaviors in the past. Simplified, that means that under given conditions, if your dog has been reinforced for jumping to greet you 20 percent of the time and for sitting to greet you 80 percent of the time, then under those conditions you can predict that he’ll jump to greet you about 20 percent of the time and sit to greet about 80 percent of the time. Limits are not enough, though. Build strong reinforcement histories for the behaviors you do want. As with children, we need to both encourage (through environmental design) and actively teach and reinforce desirable behaviors, making sure the dog finds them well worth repeating. Use great reinforcers, and many of them—and mix it up, because novelty can also be reinforcing. Once you’ve taught a behavior, you’ll need to practice it, and continue to reinforce it, in incrementally different and more distracting circumstances. Just because you can drive in an empty parking lot doesn’t mean you’re ready for a six-lane expressway at rush hour, and just because your dog can sit in your kitchen doesn’t mean he can do it at the edge of a crosswalk while a motorcycle whizzes by. Finally, when possible, harness what your dog wants most at that moment. It’s not a “competing reinforcer” anymore if you can make it contingent on the behavior you want. Dog wants to leap out of the car? Ask for a sit or down before opening the door and cueing him to go for it. Dog wants to keep playing in the yard? Call the dog from close by, then send him back to the yard. Dog wants to stalk a squirrel? Wait for a little attention and then stalk it with her. When I move toward the door to let Pigeon back in every morning, I deliberately do so while she’s still standing quietly. That—and not barking or scratching at the door—is the behavior I want more of in the future. Sometimes, to mix things up, I also surprise her with a treat or her breakfast in hand, but mostly what she gets for standing quietly is me opening the door. And that long history of getting what she wants for waiting patiently is why she didn’t immediately start barking the day that I decided to wash my hands off before opening the door. I think I owe her the same patience and courtesy.